Every year the Glendale Glitters celebration in Historic Downtown Glendale, Arizona hosts thousands of visitors who want to celebrate the holiday season in style. For 2018, Glendale Glitters events kick off on Friday, November 23, 2018, with special event weekends throughout December and the lights staying on through January 12, 2019. 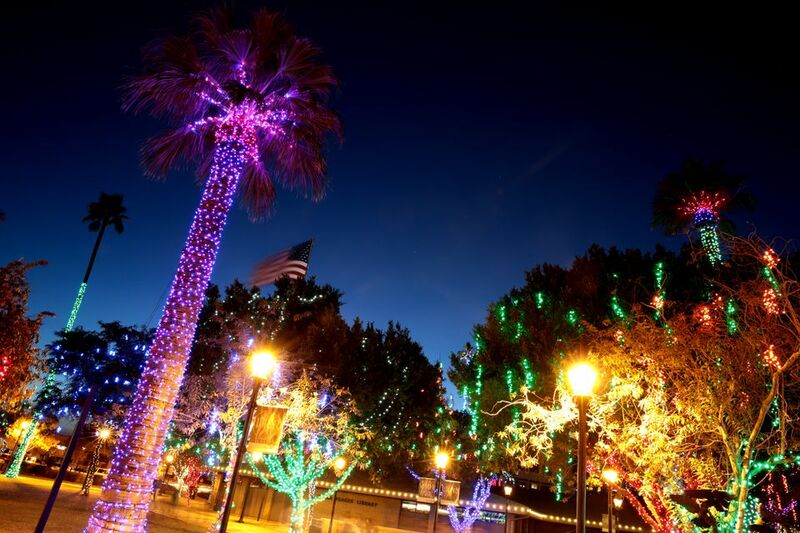 Historic Downtown Glendale comes to life each holiday season with the addition of about 1.5 million multi-colored twinkling LED holiday lights located throughout a 16-block area that includes the Old Towne and Catlin Court Districts. Arizona's best hometown holiday tradition shines brightly from 5 to 10 p.m. all nights, so even if you don't come to Downtown Glendale when it's one of the special holiday weekends mentioned below, you can still enjoy the lights, buy gifts at one-of-a-kind shops, grab a nice dinner or dessert, and take photos by the giant holiday tree—for more information on getting to Glendale from Phoenix, check out our guide "Travel Times to Downtown Glendale." Holiday entertainment, food, hand-crafted holiday gifts, a children's winter wonderland and petting zoo, shopping and, of course, visits with Santa are all on display for the "Countdown to Glendale Glitters" on Friday evening, November 23 beginning at 5:30 p.m. Spotlight Youth Theatre, Rascapetatiando Dance Company, Sun City Poms and Arizona Sun Rays on Saturday. Parking will be in short supply, but free shuttles will run from the Glendale Community College north parking lot, at 59th and Vogel Avenues, between 4:30 p.m. and 10:15 p.m. and the last shuttle will leave downtown Glendale at 10:15 p.m. Event attendees will have the option of paying for preferred parking in the two downtown garages, located at City Hall at 59th and Glenn Drive and the Bank of America Building at 58th Avenue and Glenn Drive—both garages should be accessed from 59th Avenue. Once the event kicks off, lights will remain on nightly from 5 to 10 p.m. and guests can wander through the 1.6 million LED bulbs at their own leisure. However, there are also a series of special event weekends coming in December, so if you're in Glendale for a weekend trip, try to make it out to one of the following weekends. On Friday and Saturday, December 14 and 15 from 6 p.m. to 10 p.m., Downtown Glendale asks guests to get in the holiday spirit with free admission and plenty of family-friendly fun. Make sure to also stop by a few of the many vendors that will be present throughout the weekend. The annual lighting tradition draws to a close with the Glendale Glitter & Glow Block Party on Saturday, January 6, 2019, from 4 to 10 p.m. Admission is free and thousands of people will stroll the sidewalks of Historic Downtown Glendale and watch about 20 tethered balloons gently expand as pilots fire them up, enjoying bands and street performers for a finale to the festive season. Due to the extensive street closures required for the block party, parking in the downtown area will be very limited, but for those who like a free parking option, shuttles run all evening long, between 3:45 p.m. and 10:15 p.m. from Glendale Community College; shuttles pick up from the northeast parking lots of the college. The last shuttle will leave downtown Glendale at 10:15 p.m. If you can find a spot, street parking in and around the downtown is free. After the event, Downtown Glendale's lights will be on for one more week so make sure you can make it out to Glendale before January 12 to ensure you get to see the city decorated.